Looking for the right casino can be quite the task these days, and the reason for that is very simple – there are so many good ones out there. One of the good ones we are going to talk about today is called Genesis. This particular casino has not been in the gambling industry for an extended period, because they launched in 2018. Considering they have only been on the market for one year, it is actually surprising that they have managed to run their gambling operations so successfully. Not every single casino that is somewhat new are able to become so popular in such a short period. 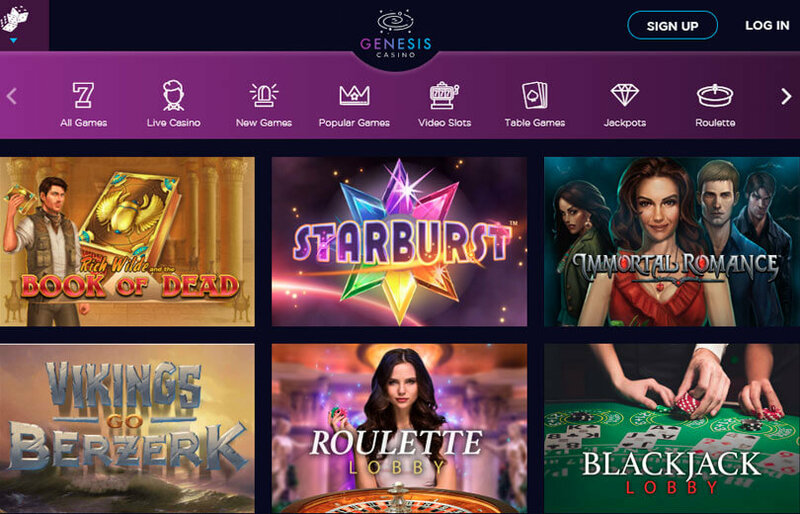 There are many good things to say about Genesis Casino, and therefore there are a lot of things we want to talk about in this review, but we won’t be able to mention all of it. Still, we will try to say the things that we think are the most important for you to know about and that is what you will find further down below. This includes the welcome bonus package the casino has for new players, if they have a mobile casino and how it works, their payment options available for players, the timeframe and limits for transactions, some info about their support team, the games they have on offer and the software providers that have created those games. Before we start talking about those things we would like to mention something about the website, and that is that it looks astonishing. Genesis has a universal theme, and you will be able to see hints of this throughout the casino. Not only can you see distant stars and planets in the background, but you will also be able to see Gonzo from Gonzo’s Quest by NetEnt with a glass bowl on his head representing an astronaut helmet. The designers working for Genesis Casino has really put a lot of effort into making the website look great. We thought this deserved some recognition and we hope you think so as well! Now let’s start talking about the more important stuff! Something you probably have been waiting to read is about the welcome bonus package. It is always exciting for new players because it gives them a chance to play for a more extended period in the casino by depositing the same amount they probably would have if there were no welcome bonuses available. Genesis Casino wants to start your gambling experience with a BANG! Here you will be able to get an astronomical offer of up to €1000 in bonus money and 300 free spins. For those that want the full amount, they will have to make four deposits. If you’re a regular gambler, we recommend that you at least play with the first deposit bonus. This is 100% match bonus up to a total of €100, and you will get all the 300 free spins on Starburst. That Genesis has decided that Starburst is going to be the slot you get the free spins on, is no coincidence. First, this is one of the most popular slots, but at the same time, it is also a futuristic slot with stars and gems. This means that it fits Genesis Casino’s theme. Something worth mentioning is that there are rules you need to follow when it comes to the welcome bonus. For example, the maximum amount you can withdraw for the money won from free spins is €100, and the wagering requirement is 40 x the bonus amount. Genesis Casino has a fully optimised platform for mobile users so you can explore the universe directly from your mobile phone. Here you will be able to enjoy a decent number of your favourite games. On their website, you will find all the most common payment options in the gambling industry. You will also be able to see the minimum per transaction for all of them, which is €10. You can also see the maximum amount per transaction, which is €5000. There are no fees attached when you deposit, and the payment options you can use are Visa, MasterCard, Maestro, Skrill, Paysafecard, Neteller, Entropay and EcoPayz. All deposits are instant. When it comes to withdrawals, it usually takes 0 to 24 hours for e-wallets, 1 to 3 days for credit and debit cards, as well as 3 to 5 days for bank transfers. The pending time is 0 to 48 hours, so it’s actually possible to get your winnings instantly if you withdraw with wallets! Customer service is not available around the clock, but you can contact them for several hours each day. If you prefer using live chat, then you can do that, but you can also contact them via phone support or email. There are tons of games available in Genesis Casino. Two of them, as you already know, are Gonzo’s Quest and Starburst. You can also play games like Raging Rex, Danger High Voltage, Vegas Diamonds, Reel Talent, Lucha Legends, Dark Vortex, Halloween Jack, Cash of Kingdoms, Iron Girl, Action Ops: Snow & Sable and Trolls Bridge! Some of the software providers are NetEnt, Big Time Gaming and Oryx Gaming. If you create an account right away, you can take full advantage of the bonus offer that we wrote about above. Imagine getting the same amount you deposit in bonus money and a total of 300 free spins. 300 free spins! We just had to say that one more time. This is a crazy amount and probably three times more than what you sometimes get in other casinos. As we mentioned earlier, these free spins can be used on the popular slot machine Starburst, and it will surely be a lot of fun! Go ahead now and open an account to enjoy everything that Genesis Casino has to offer! You will have a lot of fun if you sign up at Genesis Casino. With an excellent welcome bonus and tons of games, you can enjoy playing for hours on end. They also have fast withdrawals and a mobile casino.